Well done on successfully submitting your application! Half of applicants won’t have made it this far, so you’re already performing above average! Now it’s time to take it to the next level. Stage two of the Ernst and Young job application procedure is the aptitude test. 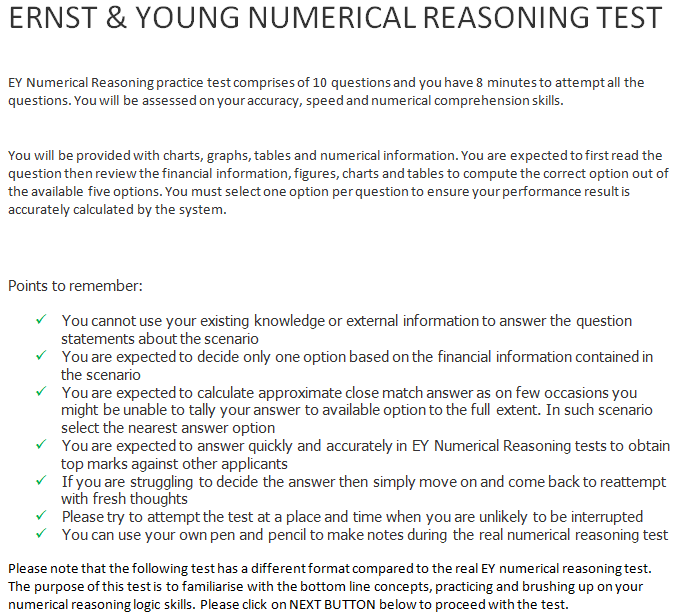 During this process, you will be undertaking numerical, verbal and inductive reasoning tests. EY Aptitude Reasoning test Guidance Video Tutorial! Once you've picked a convenient date from the options available, you will usually have a week or two to prepare. As we all know, job tests can be daunting and how can you be fully confident of putting in a perfect performance if you lack Big Four experience? 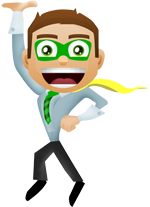 Show us your passion and hard-working attitude and we will give you the support you require to land your dream job. Ernst and Young have designed the aptitude test to assess you against their strengths criteria. 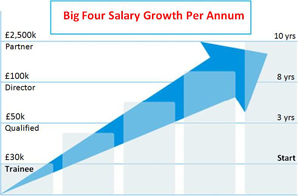 These criteria are unique amongst Big Four companies, as the others use a ‘key competencies’ system instead. The test will be time-limited, so you must be able to withstand pressure. Our training will ensure that you are fully confident and prepared for any eventuality. Imagine the embarrassment and panic caused by ‘freezing up’ during the Ernst and Young aptitude test and you’ll realise just how important this is. A. The Situational Strengths tests are based on specific business scenarios which you are tasked to rank in order from 1 to 5, with 1 being what you are most likely to do and 5 being what you least likely to do. There will be one question per scenario, leading to a total of 20 questions (20x1). There is no time limit to answer these questions however usually successful candidates complete this test within 15 to 20 minutes. You are expected to demonstrate your ability on task management, succinct communication and work ethics. Read more. B. The numerical reasoning tests are based on data presented in formats such as graphs and charts. There will be two questions per scenario, leading to a total of 12 questions (6x2) that must all be answered within 12 minutes. You are expected to demonstrate your ability with figures, your analytical skills and sensible time management. Read more. 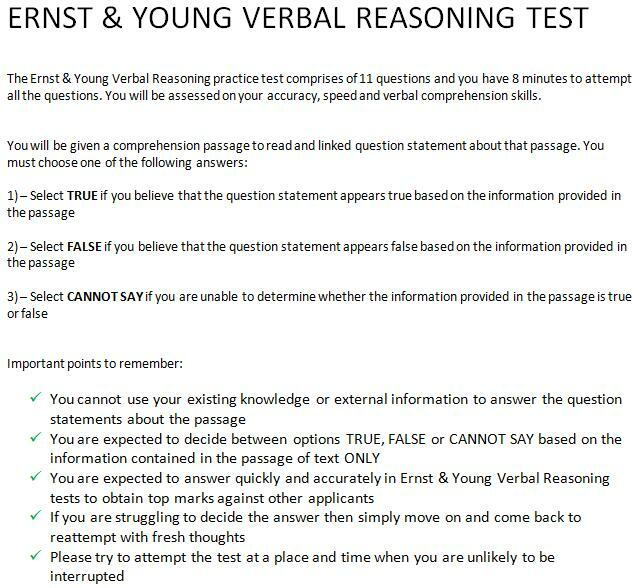 C. The verbal reasoning tests consist of a series of statements that you must class as true, false or ‘cannot say’. There will be two questions per scenario, leading to a total of 12 questions (6x2) that must all be answered within 18 minutes. 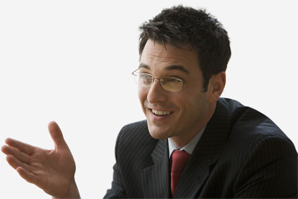 You are expected to demonstrate your business judgement and problem-solving skills. Read more. D. In the inductive reasoning tests, you must observe symbolic patterns in a sequence of graphical scenarios. You have to find a pattern then apply your theory by checking if that logic fits with the next set of figures. There will be one question per scenario, resulting in 12 questions that must be answered inside 12 minutes. You are expected to demonstrate your logical reasoning powers. Read more. Ernst and Young will not provide you with an informational booklet in preparation for this stage, so you need the relevant information and guidance well in advance. Do not think that you can successfully guess your way through the aptitude test, as you will be sorely mistaken. Your performance during the aptitude test will be kept on company record and used during Ernst and Young’s final considerations to decide whether or not you have landed the role. It is more than possible to successfully get through this stage by attaining a passing grade, but fail to secure employment when Ernst and Young take a look at your collective performances over the whole recruitment process. Ernst and Young grade your ability on each stage between 1 point and 5. It is assumed by Ernst and Young that if an applicant can demonstrate ‘core capabilities’ (strengths) and attain the full 5 marks during the aptitude test process then they automatically become a perfect match for the firm. A sample questions and answers pack, containing detailed guidance on the questions that you will be faced with and the best approach to answering them. We also offer totally free online practice tests. Click here to practice free Saville Consulting style EY numerical and verbal reasoning tests. Buy Ernst & Young Aptitude Test Preparation Course Now!